Here is a recipe for the best chicken nuggets. Ever. I love to cook for my son Titus, a toddler who can be quite picky about the food on his plate. I take great pride in cooking a meal that makes this food critic beg for more. My star dish, as far as Titus is concerned, is undoubtedly chicken nuggets. I love them too. That’s because they taste great – with that addictive crunchy bite and all – yet they are fat free, oven-baked, and ready-to-eat in minutes. 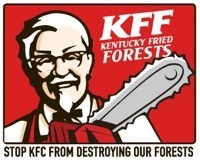 Forget KFC! Preheat your oven to 200 degrees C. Clutch the eggs in a bowl. Grate the parmesan in another bowl and stir in the bread crumbs, lemon zest and coriander powder. Season with pepper and salt. Cut the chicken filet in bite-size chunks. Dip the chunks first in the egg and then in the bread crumb mixture. Make sure they are covered well, and place them on a baking sheet lined with parchment paper. Bake in the oven until golden brown (about 10 minutes). Serve with garlic yoghurt (minced garlic, yoghurt, pinch of salt), a hot sauce or mango chutney.